Recommended Read:You must have had themes to your birthday parties as kids and they used to be so much fun, weren’t they? So why not add double excitement and fun to your wedding by having a coded theme for it? It is really not hard to pull off a color Coded Wedding or theme coded wedding. In fact, it will be a whole new and mesmerizing experience for your guests. They will love to live your wedding through the lens you choose. 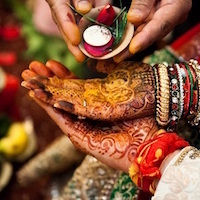 Now theme does not have to mean that the dress up has to change because there is a pretty standard dress code for Indian weddings and that adds the richness to the wedding. The elements that will emboss your theme would include the decor which consists of lights, decorations, color schemes, props and so on. Here are some ideas and pictures that will speak louder than words. Hope you find your inspiration from these themes and create a whole unique wedding for your special day! This is very classic code and represents India in the best possible way. 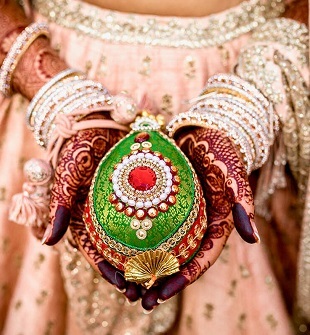 If you are a fan of the funky and bold Bollywood colors then this is the code for your wedding. It is a symbol of fun, drama, brightness, and freshness. The decor can be experimented in so many different ways, as you can see below. The colorful dupattas can be draped all around the venue and the majestic Bollywood props that would make your coded wedding outstanding. Laying down and looking up at the sky, seeing the blanket of stars illuminating the dark night is one of the most romantic activity. Imagine your coded wedding is based on this idea of romance, wouldn’t it be breathtaking? Sparkle your wedding with a starry night theme and cover the venue with glittering sparkling things, a ton of fairy lights and lanterns. Share the romance of the night with the glamorous stars in the sky and at your wedding. I can guarantee that this will be an awestruck code theme. We all wanted to live in a grand castle with a wardrobe full of ball gowns and wait for our prince charming to come on a white horse to propose to us. This is the dream for every little girl who wants to grow up to be a princess and then a queen. Now you can make this fantasy come alive along with your prince charming by having a fairytale coded wedding. Go crazy with your favorite fairy stories and get inspired by them. Be it Cinderella, Snow White, Rapunzel or Elsa. You can decorate your venue with the most amazing of fairylike things. Recommended Read: How to Prepare For a Colour Themed Wedding? Going a little back in Hollywood here. The Great Gatsby is not only retro but also royal. This code will add a touch of class to your wedding and the decor can be filled with vintage items and a rustic color scheme is the way to go. If you do not want to call it a ‘Great Gatsby’ theme really then you can just go for the plain vintage. It has a lot of common elements that go on to create that perfect good old atmosphere. Your wedding will be like a time travel back in past and that was the golden period where your wedding will mark another milestone in history. The colors will look subtle and soothing like light pinks, creams, rusts, golds etc. Put some pearls, metallics, feathers and vintage elements to your decor and get the perfect classic coded wedding. 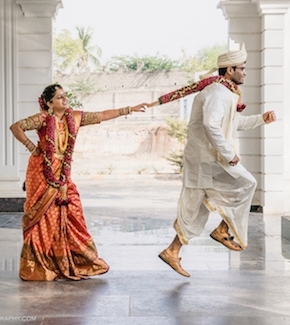 Go crazy with your coded wedding and do not feel afraid to be different. Just do what makes you the happiest as this is your wedding and you should be the one to say how your big day should be.